FFIEC Agency Supplement to Authentication in an Internet Banking Environment http://www.ffiec.gov/pdf/Auth-ITS-Final%206-22-11%20(FFIEC%20Formated).pdf. Defined as: Electronic transactions involving access to member information or the movement of funds to other parties. 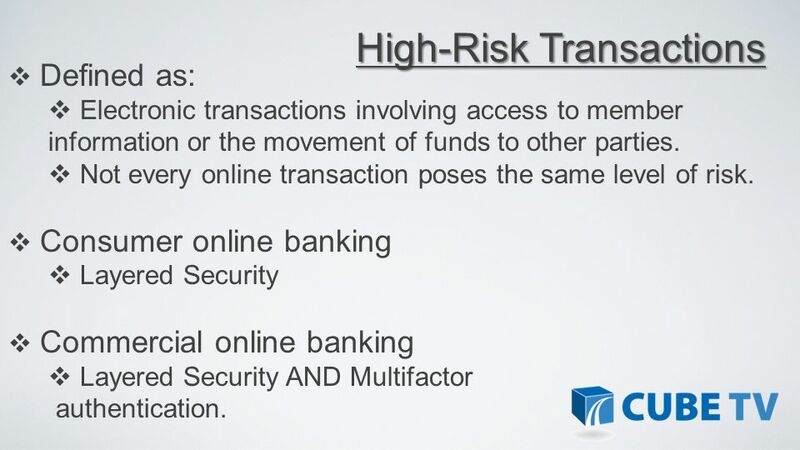 Not every online transaction poses the same level of risk. 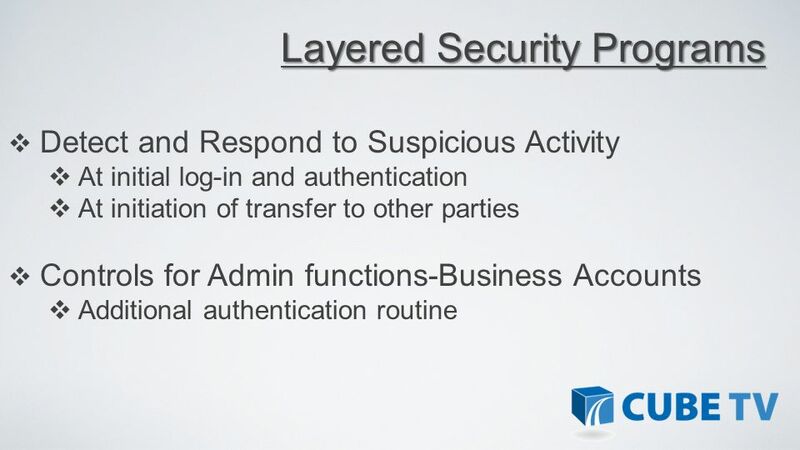 Consumer online banking Layered Security Commercial online banking Layered Security AND Multifactor authentication. 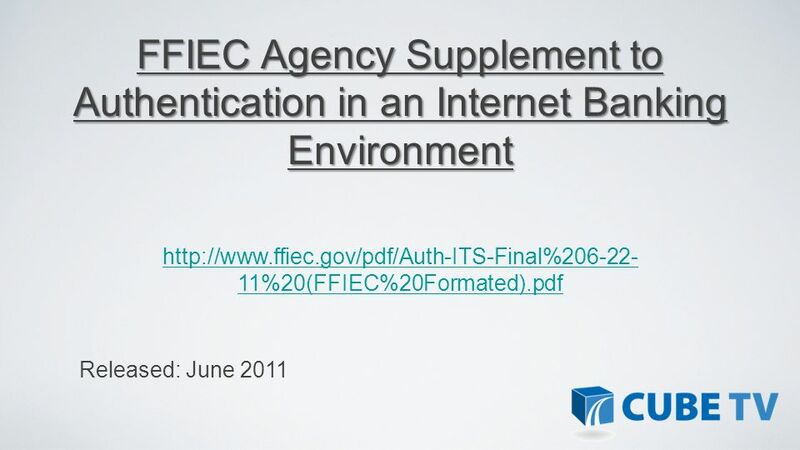 Download ppt "FFIEC Agency Supplement to Authentication in an Internet Banking Environment http://www.ffiec.gov/pdf/Auth-ITS-Final%206-22-11%20(FFIEC%20Formated).pdf." MFA for Business Banking – Security Questions with 2nd Request Multifactor Authentication: Quick Tip Sheets Note to Financial Institutions: We are providing. The Mobile Channel, TCPA and Privacy NCHELP New Orleans January 19, 2012 Mercedes Kelley Tunstall Of Counsel ballardspahr.com Jerod. ANNUAL SECURITY AWARENESS TRAINING – 2011 UMW Information Technology Security Program Annual Security Awareness Training for UMW Faculty and Staff. 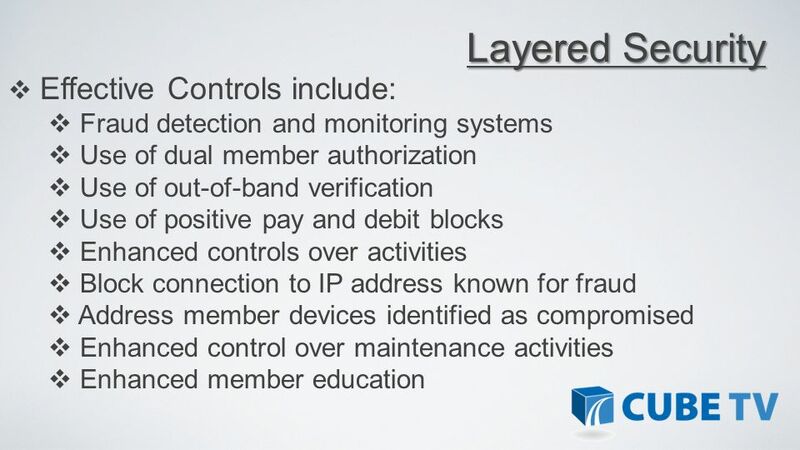 Combating Fraud Risk in Payment Systems. 2 Defining Fraud..a deliberate act of omission or commission by any person, carried out in the course of a banking. 1 2 Note: The following slides represent suggestions to enhance the writing of a SAR narrative. This information should be used in conjunction with the. BARBADOS 2013 RESPONSE OF INTERNATIONAL COMMERCIAL BANKS TO CARD PAYMENT FRAUD Presenter: Denver Frater Regional Director & Chief Security Officer Eastern. 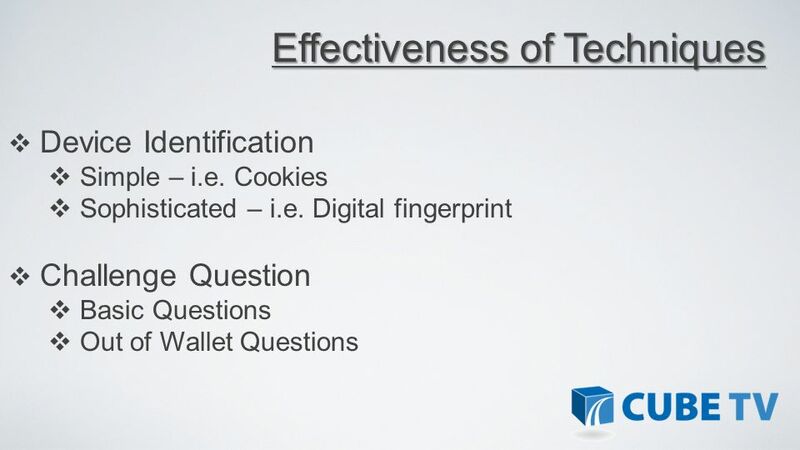 Technology Supervision Branch New FFIEC Guidance on Strong Authentication ABA Webcast January 11, 2006. Chapter 6 E-commerce Payment Systems. Traditional Payment Systems Cash Checking Transfers Credit Card Accounts Stored Value Accounts Accumulating Balance. 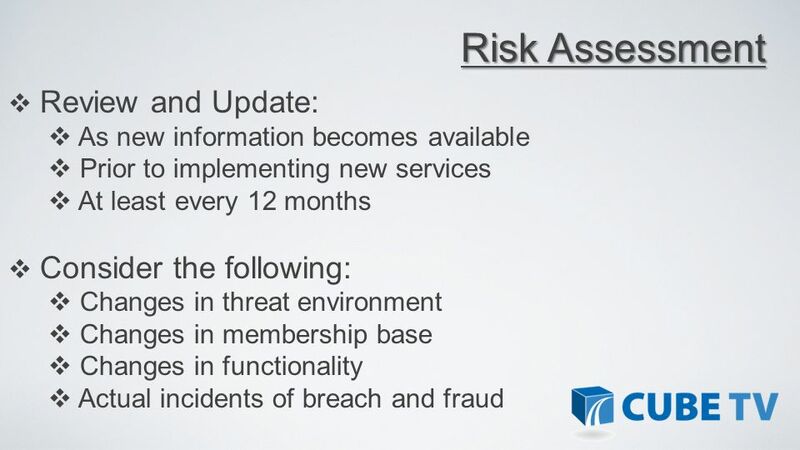 Challenges of Identity Fraud Chris Voice, VP Technology. 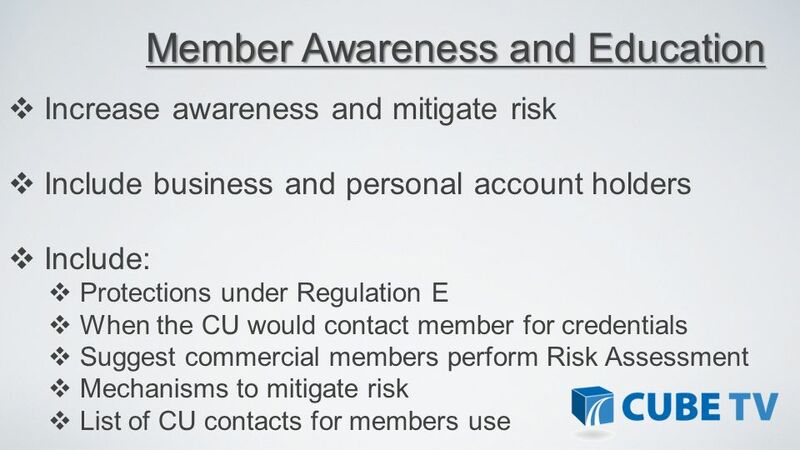 Consumer Authentication in e-Banking & Part 748 – Appendix B Response Program Catherine Yao Information Systems Officer NCUA. © ITT Educational Services, Inc. All rights reserved. IS3220 Information Technology Infrastructure Security Unit 10 Network Security Management.